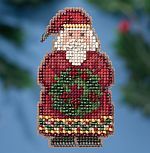 Home for Christmas from the Winter Series of Buttons and Beads comes complete with perforated paper, but can be stitched on 14/28 count fabric of your choice with a completed size of 5.25" x 5.25". The kit contains perforated paper, floss, needles, Mill Hill beads and a Mill Hill Scottie button. 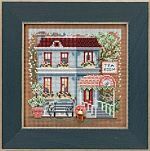 Tea Room from the Main Street Spring Series of Buttons and Beads from Mill Hill comes completed with perforated paper, or may be stitched on 14/28 count fabric of your choice with a completed size of 5"x5". 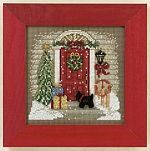 The kit also contains the floss, needles, Mill Hill beads and a Mill Hill potted flower button. 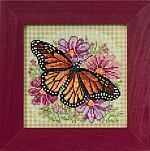 Winged Monarch a Button and Bead kit from the Spring Series is stitched on 14 count pale green perforated paper with a finished size of 5" x 5". Kit includes perforated paper, DMC floss, beads, and needles.